Fancy a free ticket? We are now recruiting Stewards! Site Crew Team – Generally available to do all the setting up of fences, seating etc. Busy times will be on the Thursday and Friday during the day, and on the Monday. We are now offering the opportunity for some site crew to work both shifts on the Monday leaving the rest of their weekend free. If you are interested please make a note in your application. (Please note, work will involve manual labour which may be inside or outside. Applicant must be fit and able). 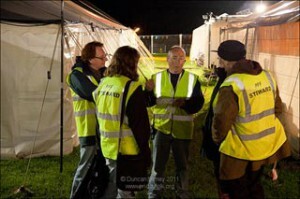 Venue Team (Concert Marquees, Dance Marquee, Childrens’ Marquee, Village Hall, Workshops) – Admission Stewards & Safety Stewards. (there may be light cleaning activities) – normally the most popular and will therefore be full very quickly. Car Parking Team – Throughout the weekend from 1pm Friday to 5pm Sunday. Busiest time will be during the day Saturday (working outside, please bring clothing appropriate for the weather). Camping Team – From Thursday throughout the weekend (working outside, please bring clothing appropriate for the weather). We do have some site crew opportunities on the Wednesday before the festival, or all day shifts available on the Monday in the clear up. 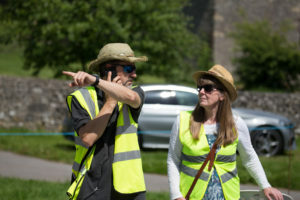 If you are fit and able and want to get your duties all done outside the festival running time tell us about it in the comments box on your application. All Stewards must have a valid e-mail address and contact phone number. All we ask is two four-hour stints over the course of the weekend (or in the lead up or on the Monday). In return you will get a full camping weekend ticket to enjoy the festival. If you have read all this and fancy becoming part of the team for 2019 then fill in the on line form. You will be asked to send a cheque which we take as confirmation of your application. We do not cash the cheque unless you do not complete your duties.